Whilst digging a new soakaway in my garden with my Ransomes MG6 backacter I made the mistake of going back over the open trench. The side collapsed and in trying to extricate myself I managed to lose a track. After an hour or so with a jack and some boards the track was back on and my neighbour pulled me out with a Dexta no harm done. That's a rare animal you have there, nice to see it earn it's keep. 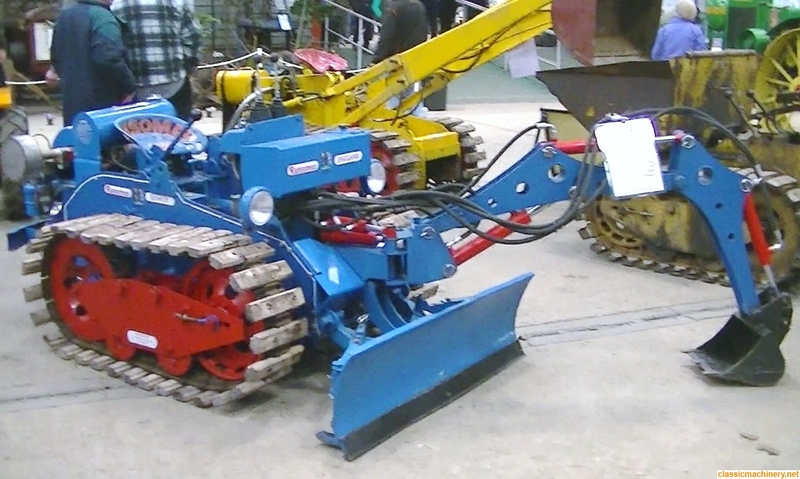 Is it the one I photographed at Tractor World (See below). If so I remember chatting to you. Thanks for the welcome. Yes it is the machine at Tractor World Fred, not quite so shiny now though.The Whitlock loader behind it on your picture is also one of mine. Sadly I have eighteen different models plus implements for them. Cool -Is that a Sauterelle backhoe ? Yes it is apparently they used to make them for MG Crawlers as a drop in pod so I asked them to make me a new one. On the subject of Ransomes I have the mortal remains of an MG40 engine in my barn if someone would to come and see it / collect it for money any kind.